My name is Amena. I'm 26 years old, and live in the UK. I work as a part-time Biology teacher at a college. My personal style is "Boho chic", I'd say. I enjoy accessorising with flowery headbands, pins and necklaces. I also like to use loose, flowing scarves and enjoy experimenting with different colours. I like to push my fashion limits and experiment with different styles, coupling different types of clothing together to ensure I remain modest and pairing clothes from different shops. I'm not much of a "designer" clothing person, but I do enjoy wearing all sorts of different clothing styles and wouldn't mind a few designer items in my wardrobe! This might make me a bit uncool, but I LOVE wearing PJ's! Outside of the home, one of my favourite things to wear are elegant dresses to parties. I'm inspired by colour and also makeup, so I often match my scarves to my makeup if I'm going out. The accessories I use are head bands, necklaces, rings, bracelets - anything girly! I love the colour purple. But, I enjoy wearing all colours. I give myself challenges to make up outfits and different styles based on different colours and fabrics. My number one style tip is, if you live in a fairly cold country, to layer your clothes to achieve a modest look when it's difficult with some of the clothes sold in high street stores. Don't forget you can check out Amena's hijab style videos on her YouTube channel. i think amena´s style is verry beautifull and feminin. I like the scarfs in light colours. I style her style as I personally dress in the same sense ''modern casual chic''! Masha'allah! 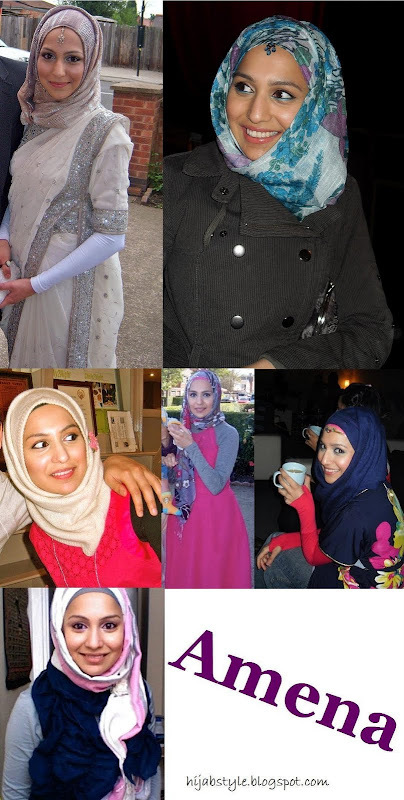 I adore Amena's style, mashaAllah she has an amazing sense of style and her various hijab styles are so inspirational! I always check out her youtube channel and I suggest everyone else does too. You will not be disappointed! Nice style! I really like that top dress- white one. Wish to see how it looks in full length. Is this a formal dress? Love the colors, and the designs on the scarves, the make-up. Her hijab style are awesome! ameena's style is gorgeeous masha'allah. im gonna check out youtube too! I second what "Anonymous" said about seeing Jana's style, even if its just photos of your fave outfits. I would love to know how you wear your scarf. Does it vary or do you always wear it the same way. Would you wear an Amira scarf outside? I love Amiras but I rarely see Hijabis wear them. I just wear them if visitors come. Mashallah she is sooo beautiful! Love her style and the head jewellery she has on, absolutely lovely! Glad you all liked Amena's style! Amena is gorgeous mashallah 3laiha! I love how she accessorizes her forehead. It's cute! I might try something similar hmm..
WOW! FAB-U-LOUS style! I adore the last two pictures with the hot pink and grey combination and the one where she has unusual sleeves. out of all the hajib-how-to videos on youtube, Amena's are definately the best. She has so many different styles and is so creative!!! Regarding the sari or 'teeka' being a Hindu religious symbol, this is untrue. I think you're confusing Indian culture with the Hindu religion. It's like saying trousers are a Christian symbol. The 'bindi' dot is different to a teeka. If it were haraam, I certainly would not be using them.